~ Relaxation is the emotional bridge to achieving a supple, loose and free-moving body. Because a muscle cannot be adequately strengthened without first being supple, and because the horse cannot be happy if it is tense, relaxation is intended to be the foundation of all dressage work. ~ Taking the time to learn the mechanics of executing a movement is essential but only half the battle. "Feel," or the sensitivity, respect and mindfulness with which we approach our horses and apply the aids has everything to do with whether or not they enjoy what we ask them to do. ~ Even the most basic exercise in dressage, such as a circle, is complex when used for gymnastic purposes. Breaking it down into parts so that we do not overreach our own skill level can be an effective way to maintain our equanimity and ensure that we do not put too much pressure on our horses who would otherwise resist our efforts to overly confine them. In First Level, the objectives and standards are, "to confirm that the horse, in addition to the requirements of Training Level, has developed thrust (pushing power) and achieved a degree of balance and throughness." The USDF's definition of throughness is, "the supple, elastic, unblocked, connected state of the horse's musculature and a willing mental state that permits an unrestricted flow of energy from back to front. These qualities are the hallmark of a correctly schooled horse." Again, we cannot have throughness and its characteristic suppleness and elasticity without relaxation. 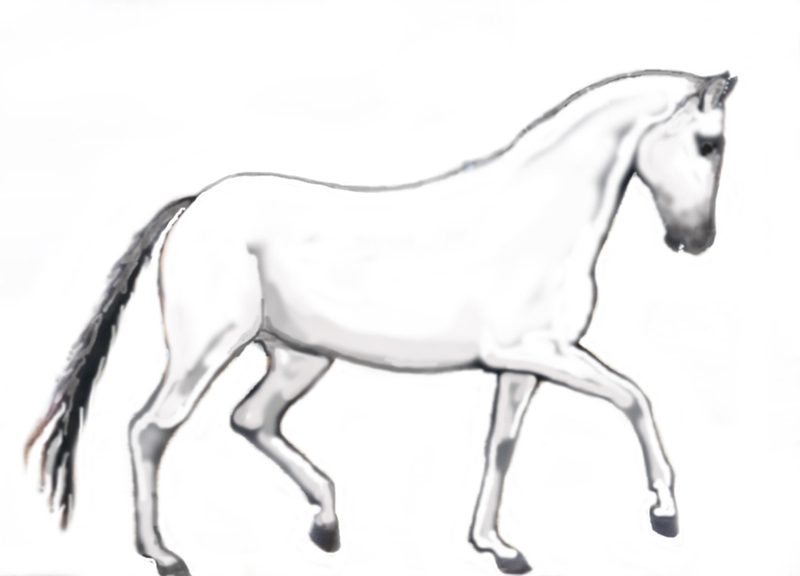 The objectives and standards of Second Level are "to confirm that the horse, having demonstrated that it has achieved the thrust (pushing power) required in First Level, now shows that through additional training it accepts more weight on the hind quarters (collection), shows the thrust required at medium paces and is reliably on the bit. A greater degree of straightness, bending, suppleness, throughness and self-carriage is required than at First Level." In place of a working trot and canter, therefore, collected trot and canter are required, and in place of a leg-yield, a shoulder-in is required. Additional movements include halt and rein-back, medium trot and canter (similar to a lengthening of stride but requiring more weight balanced on the hindquarters), half-turn on the haunches at a walk (preparation to pirouettes), and travers (haunches-in). These are far more demanding movements that, when ridden in competition, are executed "on the spot" and allowed no fudge-time. In referring back to the objectives, we can see that between First Level and Second Level there is a significant demarcation. 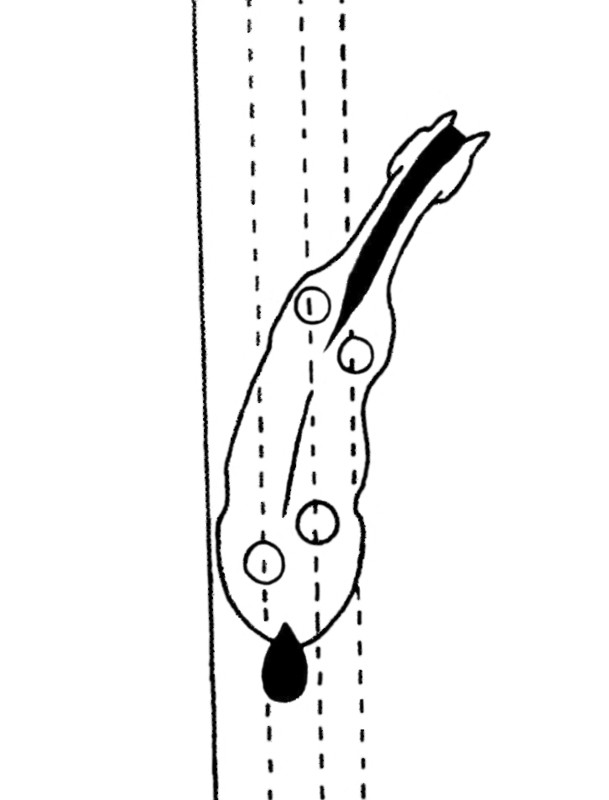 In Training and First Levels, the horse is asked to move freely forward in a somewhat elongated fashion, carrying its weight more toward the forehand. In Second Level, it is asked to shift some of its weight to the hindquarters and demonstrate a degree of collection. At the same time, the directives also call for a greater degree of suppleness and throughness - which again brings us back to relaxation. This is what is often lost as we move toward collection. 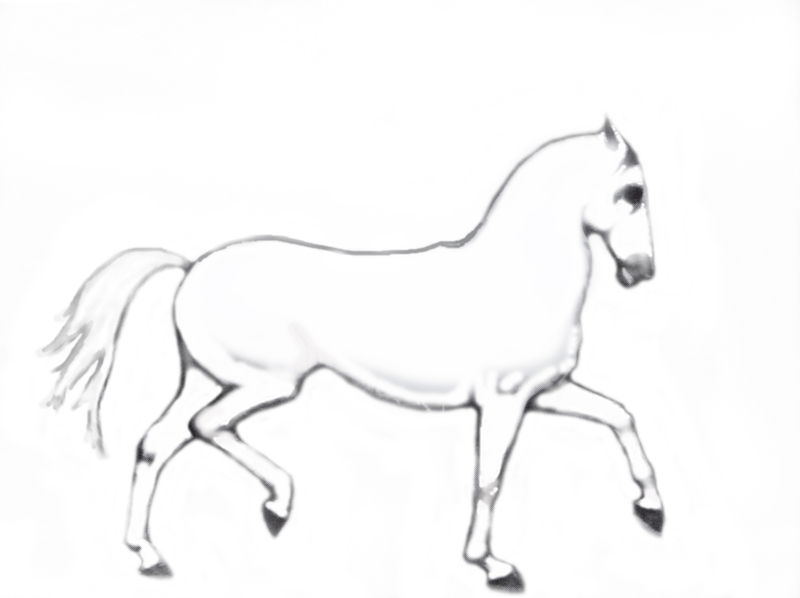 If we actually study dressage movements throughout the levels, however, we find that they were designed to help the horse maintain relaxation and suppleness while acquiring strength and ultimately collection. Relaxation is not merely intended for the beginning stages of training that we assume "ends" in the first month or the first year, but rather, it is the basis for each progressively demanding movement as we move up the levels. As previously noted, a horse's ability to enjoy what we ask of him cannot continue if tension is allowed to creep into the work, and the simple truth is that a tense muscle cannot be adequately strengthened to execute maneuvers that otherwise ensure our horses's ability to perform late in life, for only relaxed muscles and joints are kept free of injury and wear caused by strain. In a sideways movement such as a leg-yield where the horse's body is straight, the crossing action of the fore and hind legs require the adductors and abductors to stretch and flex with each stride. The hip joints are loosened and the hamstrings and other muscles around the loins are flexed and stretched as well. 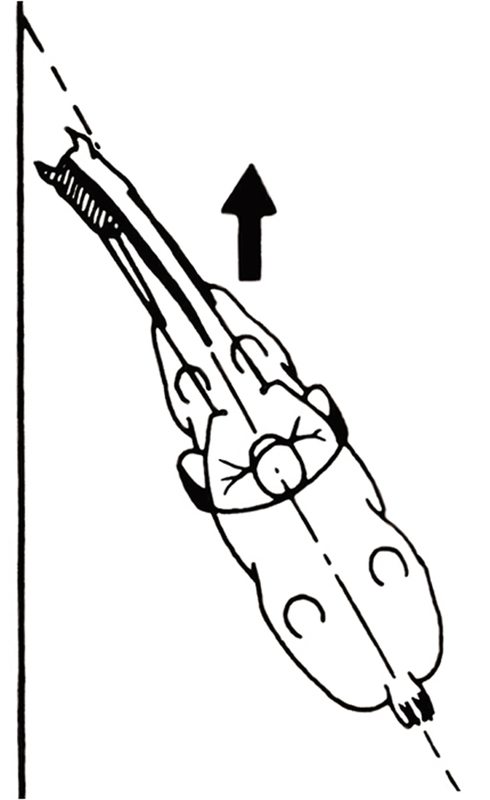 By Second Level, the leg-yield is dropped for the shoulder-in which requires a horse to move laterally with a bend in its body. Once again, the bend in all lateral movements has at least two functions: 1) to keep the horse supple, and 2) to cause the horse to rock its weight a little more toward the hindquarters for strengthening, collection, and greater agility and maneuverability. This applies to travers as well. (See figures above). For a horse to balance evenly on a bending line or with a bend in it's body, the muscles along the inside must flex and the muscles along the outside must stretch, thereby engendering suppleness laterally. 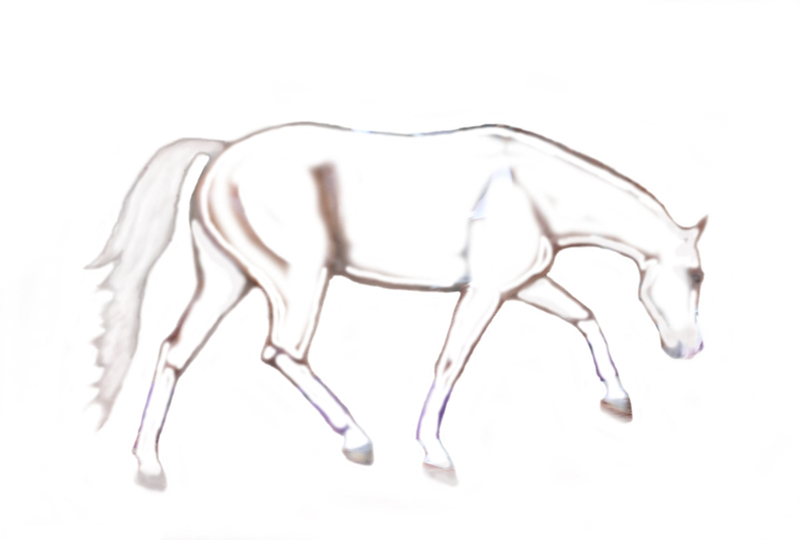 In a bend, the inside hind leg has a shorter travel distance than the outside hind leg. 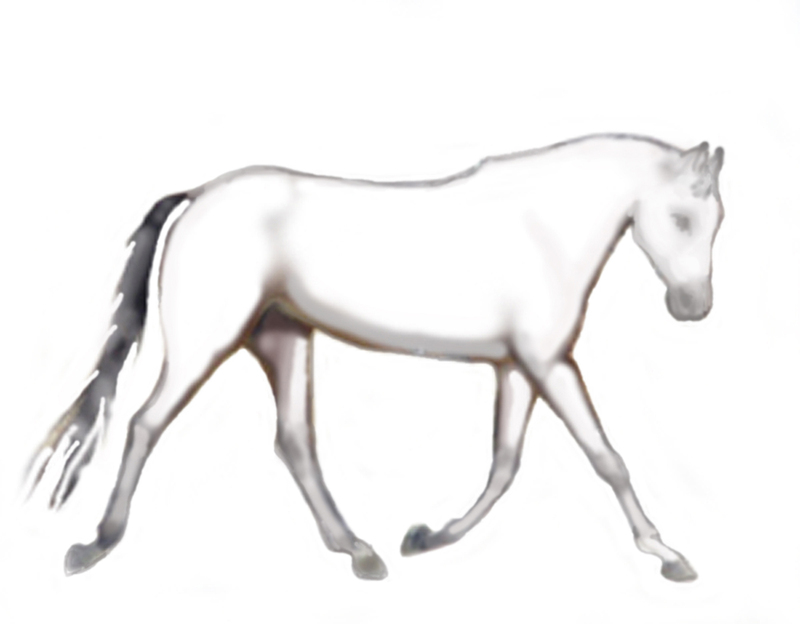 It compensates for this by reaching diagonally in front of the outside hind leg, thereby making up the distance and allowing the stride to remain even. Subsequently, each time the inside hind leg strides to the ground, it accepts the bulk of the horse's weight along with the weight of the rider and is thereby strengthened. The more acute the bend, the more the horse will rock its weight toward the rear in order to maintain its balance, strengthening the hindquarters in general. Riding a simple circle, therefore, is excellent preparation for collection because it can be enlarged for less strenuous schooling, or made smaller for more advanced work. What we often see in collected work, however, is the rider pulling back or up (or both) on the reins to "put" the horse's weight toward the rear instead of using the movements to allow the horse to collect itself. Pulling back on the reins does work, in a manner of speaking, and riders justify the method by calling it a "half-halt." Because the rider is using an official "aid," they assume that what they are doing is "correct." But half-halts, like many other dressage aids and concepts, are often misunderstood and, as with all other means of communication, have infinite ways of being applied according to the temperament, experience, skill, feel, and timing of the rider. As a result, most horses who are given "half-halts" end up shifting their weight to the hindquarters by lifting up the head and neck, and tensing and hollowing their back. In an instant, relaxation has been lost along with suppleness, looseness, and elasticity. 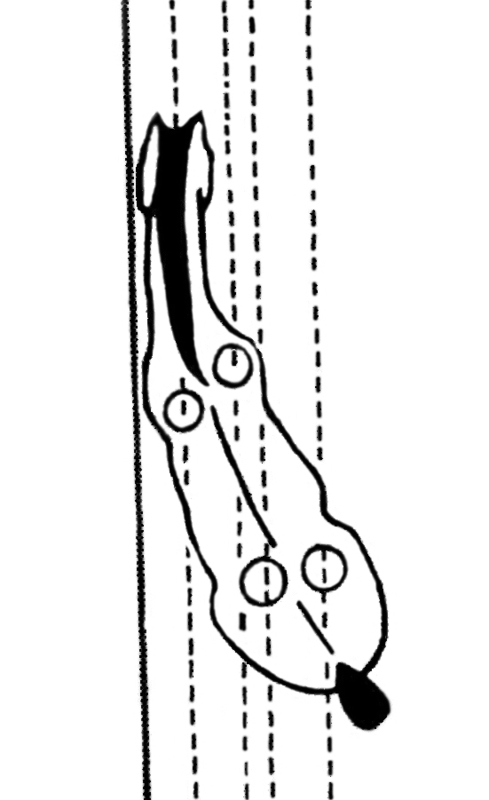 Seen by itself, Figure 5 below might appear beautiful, but compared with Figure 4 to its left, we can begin to see that true collection is created by a rounding of the back, a lowering of the hindquarters, and the bending of the joints, not by scrunching the neck and hollowing the back. Note how the horse seems to sit. Note how much farther the hindquarters travel out behind the horse. The misunderstanding of half-halts (among other things) has given rise to the assumption that relaxation cannot or need not be applied to upper level dressage. And so a primary factor in our ability to maintain relaxation as we move up the levels is learning to use the movements as a means to relaxation, instead of as a fancy maneuver in and of itself. What normally happens is that we get so focused on achieving the movement for its own sake that we loose sight of the ways we might be pushing and pulling on our horses to get it. Pushing and pulling to make our horses bend in a circle, for example, might indeed get our horses to bend in a circle, but all the qualities that make the circle physically beneficial while adding a dimension of beauty and harmony in our work - softness, lightness, self-carriage and a rhythmic and free flowing stride to name a few, all the while promoting an eager response from our mount - have gone out the window. Yet because we are able to "execute" the circle, we think we are ready for a movement that reflects a higher degree of difficulty, such as a shoulder-in. We then add the same stress and coercion used in the circle to attempt the even more complex shoulder-in. By the time we reach Third Level and try for half-passes and flying changes, we wake up to find we have a brick wall or a basket case on our hands. Sadly, that is what many of us dressage riders have ended up with. Relaxation, therefore, needs to be the mind-body bridge for us humans as well. It is the basis for our ability to be patient, to slow down and think, and to clearly see the most appropriate approach we need to take with our horses at any level. If we learn the movements and how to apply the aids for the horse's benefit, we will utilize what has been designed to help the horse maintain suppleness into collection. In this way the onus is taken off of us, the riders, to cram our horse's weight toward the hindquarters. It does, however, put the onus on us to better understand the movements, the aids, and to care primarily about the horse's emotional as well as physical well-being. This caring becomes our motivation for taking the time to break the exercises down in a manner that can be confidently executed by us, bit by bit, and understood by our horses. (Please see the Pyramid of Training article series for more detail). Every movement, indeed every stride in dressage, is ideally ridden with a "round" topline to keep the back free of tension. This is engendered, in part, by asking the horse to yield to the pressure of the rider's hand while in forward motion. In addition, allowing a horse to stretch its nose to the ground, both early in their schooling and intermittently throughout every session, expedites a release of tightness along the back clear down to the hamstrings, thereby allowing more freedom of movement and a longer stride. With the weight on the forehand, the hind legs are freed to reach farther underneath the belly, enhancing the coordination of the footfalls. If the horse remains forward and light in the hand (instead of leaning on the rider's hands for support), self-carriage is maintained which strengthens the back and abdominal muscles. As the horse is then asked to raise its head while staying soft in hand, the resulting "roundness" of the neck and back allows the horse to remain supple as the belly muscles are engaged and weight is gradually shifted to the hindquarters. The roundness of the topline must be maintained in every gait whether the horse is stretching with its weight on the forehand, in collection with its weight on the hindquarters, or anywhere in between, in order for that particular gait to be effective gymnastically. The same applies to all movements and figures. If softness and suppleness is achieved over the topline within a lateral movement, then the horse remains supple both laterally and longitudinally as it becomes more collected. In summary, if we are able to keep our horses relaxed, the movements themselves allow the horse to remain supple and then to become strong and collected. Maintaining relaxation as we move up the levels depends upon our ability to elicit softness, which means knowing when and how to release the pressure every time our horse makes a try. (Again, see previous articles for more detail). This simple directive becomes complicated when we ride movements that require a great deal of coordination from our own body parts, and so we humans are called upon to become more highly skilled and better educated. Harmonizing a mindful approach with the complexities, technicalities and precision of dressage requires us to be engaged in our own training, physically, mentally and emotionally. And while we are busy "doing" things to and with our horses, a genuine empathy for the way they experience the world can temper our urge to focus on a physical action at the expense of their well-being. Really good dressage involves a lifetime of learning, and although it remains an oftentimes daunting sport, it is uniquely effective in helping us reach beyond our current abilities while challenging us to develop inwardly in profound ways.